This is a book that speaks for itself too eloquently to need a lengthy and laudatory introduction. The appreciation of its intrinsic interest may, however, be enhanced by an awareness of the political and intellectual context in which it was produced – that of Islamic Iran moving inexorably forward to the heroic destruction of one of the most hideous tyrannies of modern times and the immense task of creating a new state, society, economy, and culture. Among the architects of this movement, the most important is indisputably Imam Khomeini himself, who in rare, almost unique fashion has come not only to exercise political and religious leadership, but also to be the symbol of Iranian nationhood and, beyond that, a precious exemplar of the human ideal of Islam. But other than Imam Khomeini, no one has had a more penetrating influence than the writer of this work, the late Ali Shari’ati. We will not repeat here the detailed and analytical biography of Shari’ati that has been published elsewhere,1 but instead draw attention to the amplitude and depth of this posthumous influence on the Iranian revolution. In all the diverse speeches, lectures and writings of Shari’ati, there is barely a single reference to the political, economic and other miseries of Pahlavi Iran, and yet it is necessary now to designate him as the chief ideologue of the Iranian Islamic revolution. His lectures at the Husayniya-yi Irshad2 in Tehran and in other forums around the country (the texts of which were generally recorded, transcribed and disseminated throughout Iran) awakened new interest and confidence in Islam, not merely as a private form of worship, but as a total world-view (jahanbini, one of the favorite terms), fully autonomous, superior to the creeds and ideologies of past and present, and bearing in its heart a revolutionary mission. A large number of the secularly educated intelligentsia who had become alienated from Islam – and thereby from their society and the masses of the Iranian nation-were drawn again to Islam as the pivotal point of both personal existence and national destiny by the eloquence, range and originality of Shari’ati’s thought. He had a style unique among modern Muslim thinkers. He had mastered (in every sense of the word) the intellectual legacy and actuality of the west, and eschewing apologetics, superficial modernism, and the mechanical coupling of “the best of both worlds,” he was able to set against it a coherent, fresh, and powerful vision that millions of Iranians found inspiring and convincing. Further, Shari’ati endowed the discussion of religious topics in Iran with a new tone of thought, a new style of discourse, and a whole set of new terms. This, indeed, was a revolutionary achievement. This achievement bore fruit in the twelve months of intensified struggle, beginning in January 1978, that led to the overthrow of the Pahlavi dynasty and the birth of the Islamic Republic of Iran. As the mosques of Iran became the ideological and organizational centers of the revolution, echoes from the work and ideas of Ali Shari’ati could be heard in many of the sermons and addresses that inspired the Iranian Muslim people to seek martyrdom. Memorable sentence from his writings served as ready-made revolutionary slogans, without need for any elaboration or commentary, and they were inscribed on banners carried in all of the great demonstrations of the Iranian revolution: “The martyr is the heart of history!” “Every day is Ashura; every place is Karbala!” Most importantly, many of those who with their blood bought the foundation of the Islamic Republic in this world, and Paradise in the hereafter were, directly or indirectly, the pupils of Shari’ati. On April 23, 1979, a terrorist group by the name of Forqan assassinated General Muhammad Vali Qarani, first chief of staff of the Iranian armed forces after the revolution. This was followed on May I by the murder of Ayatullah Murtaza Mutahhari, a close associate of Imam Khomeini, and there weeks later by an attempt on the life of Ayatullah Hashimi Rafsinjani; Forqan also claimed responsibility for those crimes. In a communiqué forwarded to the Tehran newspaper Ayandegan- always eager to print such material, before it was closed down by the revolutionary prosecutor-the anonymous hands of Forqan wrote that they were in the service of the thought of Shari’ati and attempting to realize his alleged vision of an Islam without akhunds, i.e., institutionalized religious leadership. It is highly probable that is ultimately the command of persons owing their allegiance to the former regime, and possibly, also, to the American patrons of that discredited tyranny. Certainly American officialdom has begun showing a remarkable interest in the work of Shari’ati. For example, in January, the state Department began making inquiries concerning his thought and influence, and three months later, attempts were made to recruit someone to brief Cutler, then ambassador-designate to Iran, on the same subject. Once the activities of Forqan are considered in the context of continual imperialist activity to destabilize the Islamic Republic of Iran, they appear as a tactic designed to create a dichotomy in the Islamic movement: on the one side, the posthumous following of Shari’ati, “anti-clerical” in its attitudes, and opposing them, those loyal to the religious leadership, above all Imam Khomeini. Given this probable counterrevolutionary direction of the activities of Forqan, it may be conceded that some of the followers of the movement-those entrusted with the business of killing-genuinely believe in the necessary for eradicating the ulama. All too numerous in Iran are young people whose acquaintance with Islam is recent and superficial, and for whom Islam means, above all, a permanent and unbridled revolutionary fervor. As the late Ayatullah Mutahhari pointed out, hypocrites always need fools to carry out their plans, and it is likely that Forqan is indeed an alliance of scheming hypocrites and gullible fools. The most effective way to recruit the fools, it appears, has been to invoke Shari’ati as the alleged ideologue of anti-clerical Islam. Because certain pseudo-academic authorities have attempted to legitimize this claim of Forqan to the legacy of Shari’ati,3 we would like to clarify here the attitudes that Shari’ati did in fact hold toward the ulama, the traditional leaders. It is obvious that he was not of their number, and that his ideas and expression bore a “modern” stamp that did not always correspond to their taste. His works are replete with references to western thought and history, and even though these reference are for the most part negative, they must have had a jarring effect on an extremely traditionalist audience. Shari’ati discerns, moreover, as a perpetual and universal sociological phenomenon, the existence of an “official” clergy, allied with the oppressive state and the holders of wealth, as major component in the system of injustice. Such a clergy may exist even in an Islamic and Shi’i setting and Shari’ati designated the celebrated Baqir Majlisi (d. 1699) as a representative of that class, the function of which is to destroy rather than to serve religion. It should further be noted that many of the particular criticisms of the social and political shortcomings of the ulama made by Shari’ati have also been raised with some insistence by Imam Khomeini himself. In the lectures he gave at Najaf in 1969, Khomeini repeatedly castigated those religious scholars who confined their attention to the minor details of ritual purity for betraying the dignity and true mission of their class.5 Despite differences of tone and emphasis, both Shari’ati and Imam Khomeini have contributed to the revival of religious thought and activism in Iran, and their influences have been exercised in largely complementary fashion. Any one only slightly acquainted with the Iranian revolution knows that countless Iranians regard themselves simultaneously as the followers of Imam Khomeini and as the disciples of the late Ali Shari’ati, and this entails neither divided loyalties nor mental contortions. Those who hope to exploit the ignorance and excessive fervor of a minority of young Iranians in order to create warring camps in the Islamic revolution and thereby to destroy it are liable to be disappointed. What distinguishes all of these books (particularly those of Shari’ati), and sets them apart from most critiques of Marxism attempted elsewhere in the Islamic world, are (1) an intimate knowledge of Marxism, and its philosophical foundations and (2) the attempt to point out logical contradictions within Marxism, instead of adducing scriptural arguments to underline the well-known differences between Islam and Marxism. 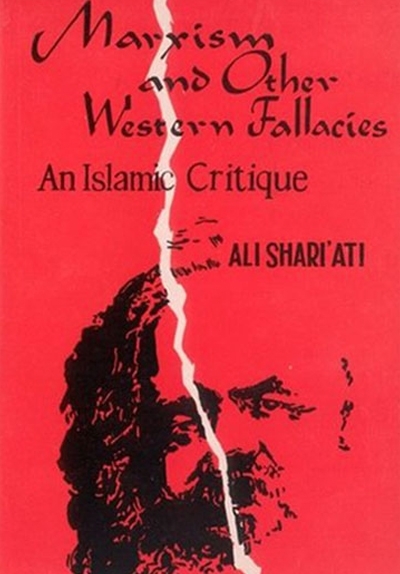 Shari’ati is aided in his task of refutation by a thorough acquaintance with the predecessors of Marxism in European thought and the circumstances of intellectual history that have left an indelible Western stamp on the doctrine, despite its having been exported to the third world as a supposed means for combating the West. His critique of Marxism is situated, moreover, in the context of a coherent vision and statement of Islam as ideology; it is plain that his strictures on Marxism are not motivated by mere negative animus. The combination of these factors permits an analysis and a refutation that are serene and self-assured as well as radical and uncompromising. The bulk of the present work consists of a series of privately given lectures, the text of which was published under a succession of different circumstances. After the release of Ali Shari’ati from his second imprisonment in 1977, the text was serialized in the Tehran daily newspaper Kayhan, from February 15 to March 15, 1977, under the title, “Man, Marxism and Islam.” This printing took place without the consent of Shari’ati, and was intended by the Shah’s regime to discredit him by planting the suggestion that be had decided to collaborate, and that this indeed was the reason for his release from prison. Shari’ati protested, and even attempted to take legal action against the editors of Kayhan, but to no avail. The text was then reprinted abroad in book from under the title Man, Islam and Western Schools of Thought. This text in turn became the basis for numerous copies circulated during the year of revolution, and it is also the basis for this translation. Our title for the series, “Marxism and other Western fallacies,” is the coinage of the editor. The second and briefer text contained this volume, “Mysticism, Equality, and freedom,” was published for the first time in 1978 in the second volume of Shari’ati’s collected works (pp.61-90). Since it discusses some of the same major themes as the first text, although with somewhat different emphases, it seemed useful to include it here as a kind of supplement. It was transcribed from a tape-recording of one of Shari’ati’s numerous lectures and, because its publication was posthumous, could not be revised by him. Him father, however, Mohammad Taqi Shari’ati, did have the opportunity to read over the manuscript before that printing and thought it appropriate to add, in the present edition, his name appears in parentheses after these notes. Both texts included in this volume are faithful and complete renderings of the original. The few liberties taken by the translator have been for the purposes of excising the repetitions and tightening the loose syntactic structure that almost inevitably characterizes the style of an extemporaneous lecture. The numerous quotations from Marx and other writers that occur in the texts are often approximate paraphrases made by Shari’ati in the course of his lecturing. No attempt has been made, therefore, to identify their precise sources. I would like to express my thanks to Heidi Bendorf for her assistance in reading and editing the manuscript. See the bibliographical introduction by Gholam abbas Tavassoli to On the Sociology of Islam: Lectures by Ali Shari’ati, trans. Humid Algar (Berkeley: Mizan press, 1979), pp. 11‐38. Husayniya‐yi Irshad: an institution of religious discussion and instruction where, beginning in 1968, Shari’ati delivered most of his important lectures to overflow crowds. Closed by the Shah’s regime in 1973, it was reopened immediately after the Islamic revolution in February 1979. See, for example, Mangol Bayat, “Iran’s real revolutionary leader,” Christian Science Monitor, may 24, 1979. This article is replete with distortions and misconceptions. Bayat claims, inter alia, that Shari’ati “was to a large extent influenced by Marxist social ideas.” (reader of the present work can easily assess the accuracy of that statement!) She further maintains that Shari’ati dismissed Qum, the major center of Islamic learning, as “an inadequate center of religion in Iran”‐ An assessment nowhere to be found in his works‐and claims that the late Mutahhari “personified all that Shari’ati and his followers stood and fought against.” This statement overlooks, among other things, the fact that Shari’ati collaborated with Ayatullah Mutahhari at the Husayniya-yi Irshad and on a number of occasions makes respectful reference to him in his works (e.g., Husayn Vares‐I Adam [“Husayn, the Heir of Adam”] [Tehran: n.d.], notes, p. 19). How, then, could there have been such a diametrical opposition between the two men? Bayatt’s claim is a gratuitous insult to the memory of both men, who struggled for the sake of the same ideal and were cut down by the dignity of the Iranian people. Also to be mentioned in this context are two influential works in Arabic by Ayatullah Muhammad Baqir assadr, a mujtahids resident in Najaf and a long‐standing acquaintance of Imam Khomeini‐Falsafatuna (“our philosophy”) (2nd ed. Beirut: 1390/1969) and Iqtisaduna (“Our Economy”) (new ed. Beirut: 1398/1977), both of which contain important sections in refutation of Marxism.